Growing up in West Africa, peanuts were everywhere: on the side of the road overflowing from large tin tubs next to the brightly colored outfits of the women selling them; squeezed into little hand-tied plastic bags and sold at bus stops, kiosks, and street corners; mashed and fried and sold as delicious peanut rings…each mouth-watering option calling your name, enticing you to stop and buy it; which, inevitably, you did. What I particularly remember, however, are the nights when the scent of roasted peanuts followed me from the street all the way home to my kitchen. I would walk through the door, take a whiff of the nut-scented air and immediately get excited about dinner. Whatever we were having, it involved peanut sauce! In West Africa, peanut sauce is cooked in a multitude of ways. 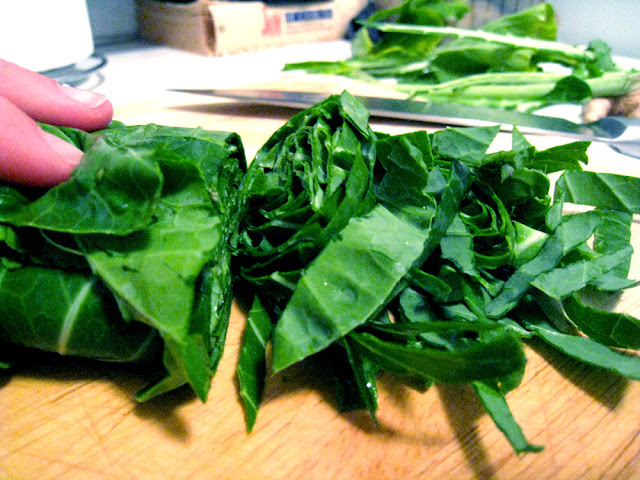 For special occasions, chicken or goat is used, but for the day-to-day version, the star ingredient is usually greens. Cooked in a base of onions, ginger, and tomatoes, the peanut butter elevates this dish of simple vegetables to a thick, rich, and marvelously satisfying meal. When I lived in Kenya a couple years ago, I was lucky enough to befriend a wonderful woman from Nairobi who taught me all sorts of tricks in the kitchen. They eat a lot of greens in Kenya – mostly kale and what everyone there calls “spinach,” a term that refers to leaves much bigger and thicker than the spinach we are used to here in the U.S. – so one of the first things I saw her do was wash and chop leaves. Watching her work, I was reminded of the images I’d seen in college classes of workers in Cuba rolling big fat cigars. She would take eight or ten leaves, pile them one on top of the other, and roll them together as tightly as possible. Then, with the swiftness of a trained chef, she would take a knife and turn the cigar into a snake of winding green strips in a matter of seconds. It was mesmerizing. Ever since then, I have rolled my greens into a Cuban cigar before slicing them. I’m afraid I’m still not as skilled as her, but I love that to this day I cannot slice greens without remembering our long afternoons spent in the kitchen together. So although this is not a Kenyan dish, when I sit down at the table to eat, every bite carries with it a hint of Kenya sprinkled among the overwhelming flavors of my childhood. Any greens will work with this stew, so feel free to replace the collards with spinach, kale, mustard greens, or whatever else strikes your fancy! In a large pot, sauté the onion in the olive oil until translucent (about five minutes). Add the ginger, chili, and garlic and cook another two minutes. Add the tomatoes and water and bring to a boil. Lower heat and simmer about 10 minutes. Salt to taste. Add collards and cook another five minutes. Stir in peanut butter until well dissolved and simmer another 10 minutes. Adjust seasoning and serve piping hot! This look so healthy and delicious! 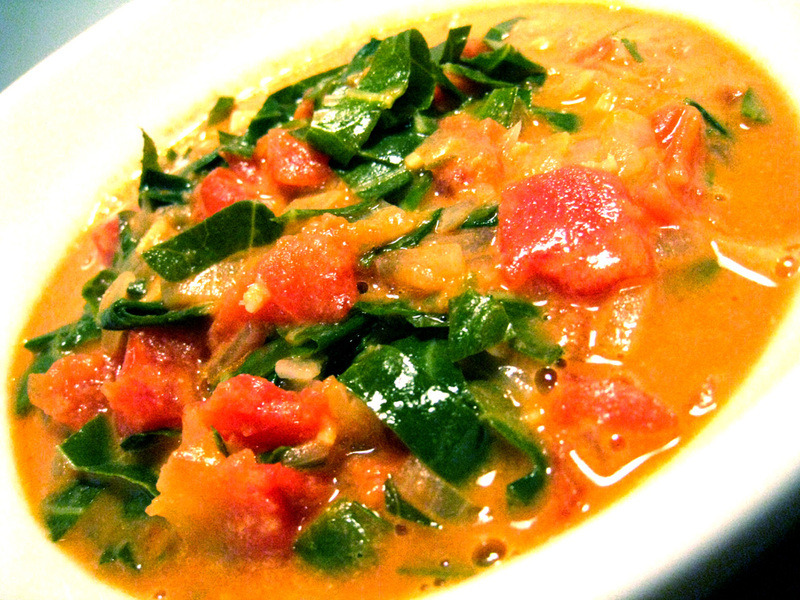 I have a peanut curry dish that I make that uses a lot of collard greens and I absolutely adore it on a cold winter day. Thank you for reminder! Oooh, peanut curry! That sounds delicious! I'll definitely have to try that next. I was looking for the almond meal pizza crust. Is it on the blog? Hi Janice! No, I make the almond meal pizza every week (and I love it! ), but I'm still tweaking the overall pizza recipe until I find one that is a hands-down favorite before I post it. In the meantime, if you want to write to me at spicybohemian@gmail.com I'll be glad to send you the crust recipe. Hope you're well!